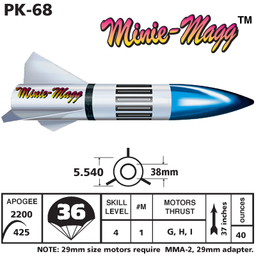 One of the ISP PERFORMANCE SERIES of kits, which feature factory pre-slotted airframe and through-the-wall fin construction and high power motor capabilities, the MINIE MAGG is the largest kit available that can still fly on a G-80 motor with an optional MMA-2 adapter. The 38mm motor mount is great for Level 1 and some Level 2 motors. It is a very versatile rocket. Parachute Recovery. Single motor flights to over 2,200 ft.
with previous model rocket building experience.